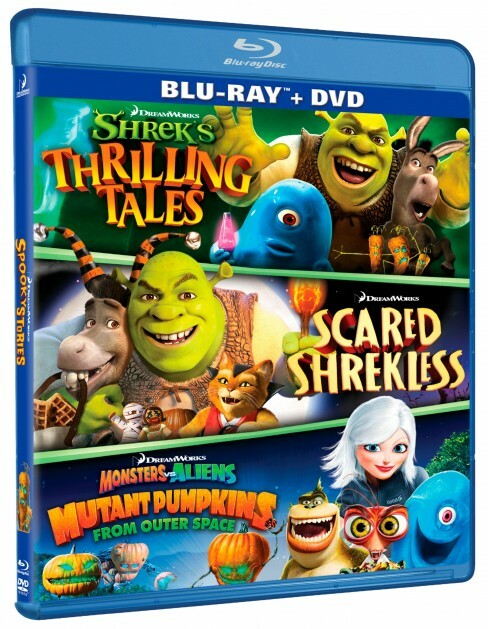 DreamWorks Spooky Stories is the ultimate Halloween compilation, featuring the spookiest and funniest characters from DreamWorks Animation’s successful Shrek and Monsters vs. Aliens franchises. Join Shrek, Donkey, Puss and B.O.B. as they get the fright of their lives in six fun shorts, including two brand NEW titles: Shrek: The Pig Who Cried Wolf and Monsters vs. Aliens: Night of the Living Carrots. 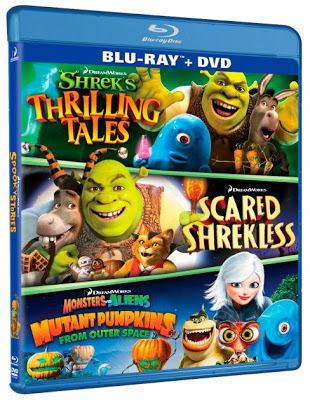 The collection also includes Scared Shrekless, Monsters vs. Aliens: Mutant Pumpkins from Outer Space, The Ghost of Lord Farquaad and the outrageously Shreked out parody of Michael Jackson’s Thriller. DreamWorks Spooky Stories also includes optional pop-ups on Night of the Living Carrots and the World of DreamWorks Animation featuring previews, music videos and more. Halloween and Fall is my favorite time of the year. I love the color, decor, the weather and all the yummy warm, delicious treats that come along with it. In our house we do 31 days of Halloween movies, so when I received Spooky Stories in the mail I knew I had to move Spooky Buddies back a day and watch this blu-ray disc that includes different Halloween tales from our favorite characters from the movies Shrek and Monsters vs. Aliens. I wasn't wrong. This was a perfect watch that kept my kids attention as there were more than one story to watch and the kids loved it. I plan on taking this to our annual Pumpkin Carving party we have with all the cousins this year so the other kids can enjoy this movie as well. I absolutely loved Shrek and the gangs version of Thriller, this made my day and made me love Shrek even more. This is a perfect watch for the entire family and it's perfect and just in time for Halloween! Disclosure: All opinions are my own. I received Spooky Stories at no cost for the purpose of this review. No other compensation was received.